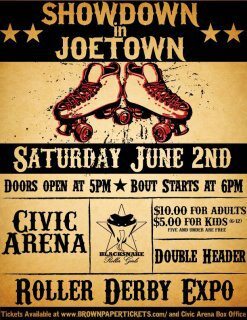 KC Derby Digest is thrilled to be attending tomorrow night’s Showdown in Joe Town! The Shotgun Sheilas of Dead Girl Derby are taking on the Jesse Janes of the Blacksnake Rollergirls, and afterwards, The Royal Pains take the track against the Venomous Vixens. Click on the graphic for tickets. Doors open at 5:00 and the games begin at 6:00. We hope to see you all up in St. Joseph this weekend!